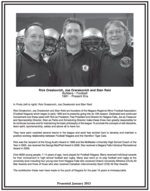 Rick Oreskovich, Joe Oreskovich and Stan Reid are founders of the Niagara Regional Minor Football Association (Football Niagara) which began in early 1999 and is presently going into its 15th season. Dedicated and continued involvement over these years with Rick as President, Past President and Director for Niagara Falls, Joe as Treasurer and Sponsorship Director, Stan as Parks and Scheduling Director make these three men greatly responsible for its continued success and for maintaining the basic philosophy of the league: To promote the concepts of self-discipline, team spirit, sportsmanship, safety and above all to have fun. They have each coached several teams in the league and each has worked hard to develop and maintain a positive working relationship between Football Niagara and the Hamilton Tiger Cats. Rick was the recipient of the Doug Austin Award in 1999 and the McMaster University High School Coach of the Year in 2005. Joe received the George MacPhail Award in 2008. Stan received a Niagara Falls Individual Recreational Award in 2009. Over 8000 young people, 7-14 years of age, have played for Football Niagara. Many received individual awards for their involvement in high school football and rugby and many also went on to play football and rugby at the university level including four young men from Niagara Falls who received Ontario University Athletics (OUA) All StarAwards and three of those who also received Canadian Interuniversity Sport (CIS) All Star Awards. The contribution these men have made to the youth of Niagara for the past 15 years is immeasurable.